Sun rising over the lotus shaped towers. Buddhist monks meditating by the reflecting pool. Macaque monkeys harassing tourists for scraps of food. These are the images that spring to mind when hearing mention of Cambodia, the majestic expanse of Angkor Wat and the temples of the Angkor complex just outside Siem Reap. It is stunning, ethereal, thought provoking and of huge religious importance, there’s no denying that. And it’s a must-see for any visitor to this South East Asian country. But my two week trip here showed me that Cambodia has so much more to offer. Twenty two years removed from a war with Vietnam and barely thirty five years after losing 20% of the population to the genocide of Pol Pot, I discovered a Cambodia that is proud of where its people are today, a population of hard working people, ever willing to show off their achievements. Phnom Penh was probably the biggest surprise of my trip. A bustling French colonial city, it lacks the high rise buildings and glaring neon signs of a traditional Asian capital. Sidewalk cafes spill out onto the wide promenade along the Mekong, the perfect place to sit with a cold Angkor beer and watch the fishing boats putter by. The best way to understand the resilience of this amazing country and its beautiful people, is to endure a visit to the Genocide Museum and Killing Field. It’s easy to get trips to both from Phnom Penh and my day spent visiting these sights was probably one of the most disturbing days of my life. I saw sights and heard tales that bring tears to my eyes every time I recall them. The overwhelming question that came out of the day was “why?” We muttered it to each other, that one word, over and over on the bus back to the city. We were astounded that humans could be so cruel. And yet the Cambodian people NEED us to see this, to see that they have overcome the horrors inflicted on them by this brutal regime and have begun the tedious rebuilding process with a sense of pride unparalleled in the First world. The second biggest city in Cambodia is Battambang in the north-west and we made our way here from Phnom Penh on a packed public bus. Despite a population of almost a quarter million, this town has a very rural feel to it. Students take picnics on the grassy banks of the Sangkae River, brightly clothed women sell fresh fish, meat and fruit at the huge open air market, tourists dash across dusty streets to avoid the swarming mopeds. I loved the feel of the whole town, surely enhanced by an amazing experience of being taught to cook by a renowned local chef at a restaurant oddly named Smokin’ Pot! On our second day here we hopped onto the back of motorbikes driven by local guides and headed out into the countryside. Here was a Cambodia I had pictured, the red, sandy roads, the bright green rice paddies, thatched houses on stilts perched above muddy lakes. We interacted with the incredibly hard working people involved in the local industries of rice paper, clay pots and Morning Glory farming and they happily demonstrated their incredible work ethic. To travel between Battambang and the tourist mecca of Siem Reap, we took a long boat ride through the floating villages on the Tonle Sap River which opens out onto Tonle Sap Lake, the largest freshwater lake in South East Asia. This was an amazing experience, seeing the schools, police stations, temples and even hospitals on floating rafts that move as the river levels change! There is no indoor plumbing here and very few houses have electricity, but most of them have very incongruous looking satellite dishes perched precariously on their wooden roofs, ensuring entertainment between fishing trips! It was heartwarming to see the children running out onto the porches of their houses, so excited to see foreign visitors, waving and yelling the first English word they’re taught, “hello”! Siem Reap is a busy town, packed to bursting with tourists and catering to them with night clubs and western stores. There are some beautiful hotels here and the prices are surprisingly good! I was unable to make the trip to any of the temples that make this area so famous, other than a brief visit to Angkor Wat. Those in my group that saw them, though, were impressed with the Buddha faces carved into the towers of Bayon and the roots of the massive trees overtaking the ruins of Ta Prohm, made famous by the Lara Croft movie. Many of the ruins were used as strongholds by the Khmer Rouge and it’s heartbreaking to see the shell damage and bullet holes in these important historical sites. But the Cambodian people are working incredibly hard at restoration and have successfully rebuilt huge sections of the temples destroyed during the violence of the past few decades. Clinging to the banks of the Mekong River, a kilometer inland from the Gulf of Thailand is the small market town of Kampot. From here we took a day trip through the countryside and were led through rice fields only recently cleared of landmines by the UN, to climb up stairs cut into a cliff face. Here we ventured into a steamy cave, greeted by many bats, to discover what is thought to be the oldest temple in Asia, dating back to the 6th Century. In the evening we boarded a small, traditional Khmer boat and took a sleepy cruise along the Mekong out into the open sea. We stood on a sand bank and watched possibly the most spectacular sunset I’ve ever seen, the craggy coastal mountains behind us. As the sun dipped below the horizon we headed back to town past the stilted houses of the villages along the river, passing huge numbers of fishing vessels as the locals were just starting their work day. 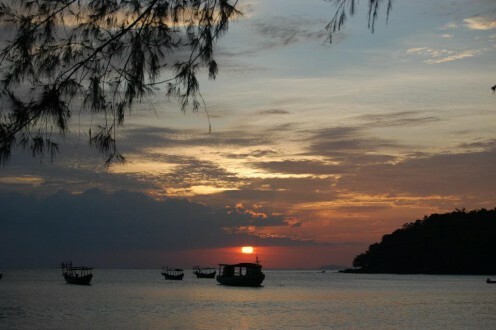 A busy 2 weeks ended perfectly on the south coast in the resort town of Sihanoukville. This is becoming quite commercialized but I loved it. Large high end hotels are springing up right along the coast and it is hoping to eventually be billed as the “new Phuket”. Taking a lesson from the mistakes of that Thai resort, though, they are making all efforts to make locals and visitors alike aware of the signs of child exploitation and hope to change the perception of Asian tourist towns. A few days of wandering through the markets here and sipping cocktails watching the sun set over the Gulf of Thailand allowed us to take stock of all the sights and sounds we’d experienced since our arrival. From the busy nightlife and temples of Siem Reap in the north to the white sand beaches and turquoise ocean of Sihanoukville in the south, the temples and palaces of Phnom Penh to the traditional industry of Battambang, Cambodia left me wanting more. These places, these people, have found a very special place in my heart and my return is guaranteed.